Vice President Mike Pence pushed back against suggestions man-made global warming played a role in making Hurricane Michael more intense. “As the president has said, the climate is changing, but what the causes of that are, are yet to be seen,” Pence told reporters while in Moultrie, Georgia, surveying hurricane damage. “The reality is it’s some of the worst storms that have ever affected this area were 50 and 100 years ago,” Pence said. Pence’s remarks echo President Donald Trump’s recent comments on global warming. Trump told “60 Minutes” on Sunday that “we had hurricanes that were far worse” in the past and said scientists had a “political agenda” when it came to global warming. 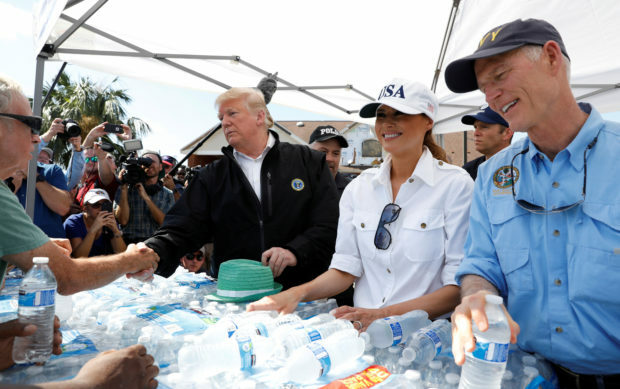 U.S. President Donald Trump, first lady Melania Trump and Florida Governor Rick Scott (R) help distribute water in the town of Lynn Haven, Florida, during a tour of areas ravaged by Hurricane Michael in Florida U.S., October 15, 2018. REUTERS/Kevin Lamarque. Hurricane Michael hit the Florida Panhandle at just under Category 5 strength Oct. 10. The storm devastated Mexico Beach and surrounding towns before slightly weakening over Georgia. However, Michael was still a Category 3 strength storm as it made its way into Georgia, making it the most powerful hurricane to hit the state since 1898. Michael did $2 billion worth of damage to Georgia crops, Pence said. “The best scientific info we have now is that the probabilities of these intense hurricanes — from the point of view of both wind and water — are going up in many places because of global warming,” hurricane expert Kerry Emanuel told CNN. Regardless, Michael was still devastating for a wide swath of the southeastern U.S., possibly causing upwards of $30 billion in damage. Officials raised the storm’s death toll to 26 on Tuesday.